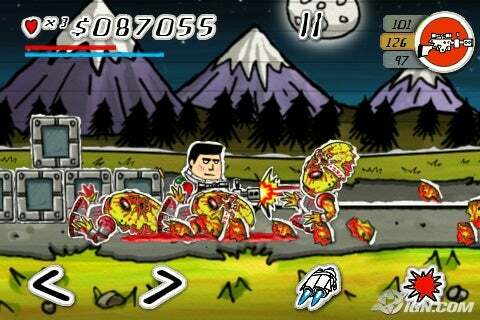 Inkvaders HD by Chillingo is a simple side scrolling Zombieville USA type game for the iPad. 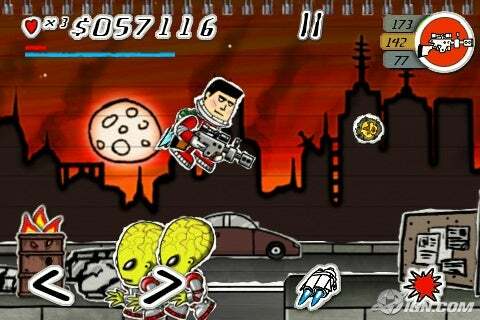 Just like the iPhone version of Inkvaders (only with iPad optimized artwork), you advance through chapters on the moon, the earth, and various other space planets in an effort to survive while killing as many aliens as possible before they kill you. Status bars on the upper left hand corner measure your health, lives, how much jet fuel you have left for jumping and flying through their air, and how much money you’ve collected over time through a combination of killing and finding various Mario-like bonuses that come out of the blocks when you tap them on your furious fast walk to the finish line. Watch out for the aliens with headbands, as they run quite quickly in pursuit of you. Other deadly opponents include the aliens that are dressed like doctors in a haunted house. Their shots are deadly and they’re more difficult to kill than your typical otherworldly creature. As you advance through levels the aliens become more resistant to human weaponry, which means you must rise of the occasion by purchasing better guns. Red vending machines distributed along the way give players the opportunity to buy bullets, health, jet pack power, and upgrade artillery. 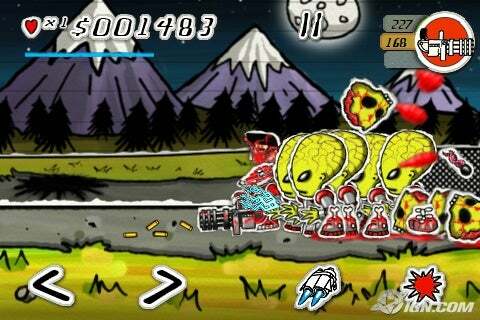 At first upgrades seem to obliterate the aliens by sending them away in splatters of red, but the game gets more difficult over time and before long it’s time to upgrade again. The element of saving and purchasing new guns adds an element of fun to Inkvaders, but after awhile every single one of the 30 storybook levels, while clever, start to feel a little the same. Expect to get a couple great hours out of this game before passing it over for something new. Bottom Line: Inkvaders is a side scrolling alien killing game with nice design and clever touches, but perhaps not the most compelling replay value.